It’s getting chilly in our part of the world. And the nights are getting longer. Time to warm up with hot apple cider! This spicy version brings out the best of autumn (and rum helps tame fall’s gloomy chill). But it’s great sans alcohol, too, so the whole family can enjoy. 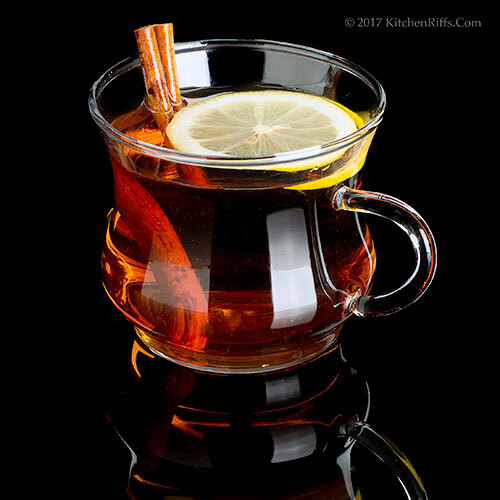 This drink is easy to make: Just heat apple cider on the stove, add brown sugar and spices, then pour into a mug that you’ve spiked with rum. How much rum to use? Anywhere from ½ ounce to 1½ ounces, depending on how strong you’d like the drink to be. Or skip the rum entirely and still have a delicious warm beverage. It’s been a tradition in our household to make this drink on Thanksgiving Day, as a treat before turkey time. But we also enjoy drinking it throughout winter to chase away the gloom. We’ve been drinking it for decades – so long that we’ve forgotten where we got the recipe. Speaking of which: We use the word “recipe” loosely here. This is definitely a concoction that you should season to taste. And make in whatever quantity you want. So experiment. Our recipe calls for a quart of apple cider (or apple juice), which will make 4 to 6 servings. But it’s easy enough to pare back on the quantities, or increase them. Leftover spiced apple cider will keep for a day or two if refrigerated in an airtight container. Pour the apple cider into a saucepan that holds at least two quarts. Add the brown sugar, ground cinnamon, ground allspice (if using), and whole cloves. Bring the cider to a simmer, then let the spices mingle with the cider for 5 minutes or so. Taste, and adjust spices if necessary. When ready to serve, add dark rum to each serving mug (adjusting the quantity to your taste). 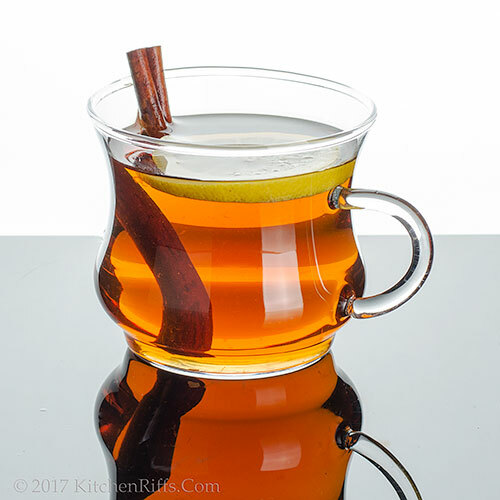 Fill each mug with hot spiced apple cider, add garnish if desired, and serve. You can substitute whole allspice berries for ground allspice if you wish. A dusting of freshly ground nutmeg would also be a welcome addition to this drink. We’ve never made this drink in the microwave, but that would probably work. Just make sure to use a microwave-safe container (such as Pyrex) that’s large enough to keep the cider mixture from boiling over. You could also probably make this drink in a slow cooker. Just pour all the ingredients (except rum) into the slow cooker and let the appliance do its magic for several hours. We haven’t tried this, but don’t see why it wouldn’t work. What’s the difference between apple cider and apple juice? Well, in some US states (Massachusetts, for example) the law specifies that apple “cider” must be made from raw apple juice that has not undergone a filtration process to remove pulp or sediment. In these states, the product sold as apple “juice” is generally filtered juice that has been pasteurized. In other places, there is no legal difference between the two – the same product might be called “cider” or “juice,” depending on local preference. You can buy apple cider or juice that has been pre-spiced. We like to spice it ourselves, but to each his own. You can also buy spiced rum. We’ve never tasted one that we liked, so we can’t recommend any. Speaking of rum, we think this drink tastes best when made with dark rum. But substitute amber rum if you prefer (or if that’s all you have on hand). The flavor won’t be as deep, but it will still be good. Our favorite dark rum for this drink is Myers’s, a Jamaican rum. But any good name brand will work. Ahh, Mrs K R. The apple of my eye. I have to try your recipe John, it reminds me of the hot rum drinks we have on the coast of northern Germany . Prost! What a beautiful drink! I love all the spices here, John. The conversations between you two always bring big smile on my face. Hi Gerlinde, rum takes really well to hot drinks -- such nice flavor. Thanks for the comment. Hi Angie, we really enjoy writing those conversations (yes, we both write them). And they're very true-to-life. :-) Thanks for the comment. First pic is awesome, John! It looks delicious and I can think of nothing better on a crisp fall day! Now I know what to do with the slow cooker! And I agree with buying spiced rum. Thanks for sharing! Hi Pam, that first pic was fun to shoot! Took me a bit of time to figure out how to do it, but worth it. :-) And this drink is totally worth the time to make! Thanks for the comment. Love mulled spiced autumn drinks! So cozy. Wow your apple cider is so clear and vibrant! Stay warm and cozy! Hi GiGi, below 70? Gosh, better bundle up and have one or two of these. That'll do the trick. :-) Thanks for the comment. Hi Bobbi, don't you love hot apple cider/juice drinks? We sure do! Thanks for the comment. Yum! It looks and sounds delicious. One of our neighbors handed these out in to go cups for the parents of Trick or Treaters last night. What great neighbors I have!!! Hi Pam, you have terrific neighbors! What a nice treat. :-) Thanks for the comment. First off, that is a dreamy pic. This is a healthy drink :D So perfect for fall! I am going to give it a go in the slow cooker. Hi Ansh, this was a fun photo subject! Even more fun to drink. :-) Thanks for the comment. I love this tradition and I'm with you John. I think a drink like this just might keep the doctor away. In any case, I'd be willing to give it a try! The nights have gotten very cold, fall has arrived in California! Hot spiced apple cider sounds divine. I like the idea of rum or not, that way everybody can enjoy. Hi Abbe, home-brewed (so to speak) medicine is the best, isn't it? :D Thanks for the comment. Hi Deb, this really does tastes good with or without the rum. Somewhat different flavor profiles, of course, but bot h are good. Thanks for the comment. Sounds like a great drink to warm up with. I will be making this soon, my grandchildren would love it. Note to self: buy rum. Buy cider. Hi Dawn, this is so nice on chilly days or nights. :-) Thanks for the comment. Hi Mae, enjoy! :-) Thanks for the comment. Spiced cider is my favorite fall drink. This looks perfect! Mmmmm this is one drink I love! Yours looks perfect! Hi Shibi, it IS perfect. :D Thanks for the comment. Hi Vicki, hot spicy apple cider is good, isn't it? Thanks for the comment. Spiced cider is a must right now! I love that you included rum! Hi Merryn, important to drink your fruit & veggies! :-) Thanks for the comment. Hi Kelsie, rum combines really well with cider -- great flavor match. Thanks for the comment. Thanks for the explanation of the difference between apple cider and apple juice- this is new information for me. And my eyes widened at the idea of making a 'microwave cocktail'! Hi Fran, we're intrigued by the idea, too! Haven't tried it yet, but we will. :-) Thanks for the comment. I’m so glad you put a little explanation about the difference to apple cider and juice, because in the UK cider is an alcoholic sweet fizzy apple drink, which is pretty strong and not overly nice. Although very popular, from your explanation in the UK we would call the clear juice ‘from concentrate’ and the cloudy juice ‘100% fresh’. It’s funny how we all speak the same language yet can completely confuse each other so much. Lovely recipe, I’ll take one with rum please! Hi Emma, in the US we call alcoholic cider hard cider. And that gets confusing, too, because there's beer-like hard cider that doesn't contain that much booze and is always consumed cold, and higher proof brandy-like hard cider (usually called apple jack) that is used in cocktails. Anyway, use 100% fresh -- with rum! -- and you'll be fine. :-) Thanks for the comment. Oh how I could use a cup of this right now! Talk about kicking this cold right out of my head. Sending the hubby to buy some apple cider! Thanks John! Hi MJ, you definitely need some of this! :-) Thanks for the comment. I am absolutely making this soon! I can taste it now and I love that it is an annual tradition. Thanks for sharing this amazing recipe! Hi Tricia, one of our favorite traditions! Thanks for the comment. This drink looks AMAZING, we've had gloomy weather for the last week but it is finally clearing out. No rum for me too :) but lovely drink indeed. Hi Amira, you'll be glad to know this is excellent without the rum! :-) Thanks for the comment. Love your photo...no on does drink photos the way you do. Your cider drink has me remembering pressing cider at our orchard. Just a little info, a bushel of apples (40 lbs.) makes about 3 gallons of cider. Hi Karen, must have been really nice to have freshly-pressed cider. :-) Thanks for the very kind comment. This recipe is just in time - I am headed to the cider mill today! I love the idea of making this a Thanksgiving tradition. I bet it would be great with bourbon too. Hi Laura, the timing is indeed perfect! Haven't tried this with bourbon -- will have to do that. :-) Thanks for the comment. A perfect drink to wash away the winter blues and chills! I love hot apple cider and adding rum would make it awesome! Hi Eva, we love this drink at this time of the year! Thanks for the comment. Hi Liz, this is just as good in spring as in fall. :-) Thanks for the comment. Hi Frank, we had this again last night. With a fire. :-) Thanks for the comment. Yes, indeedy! 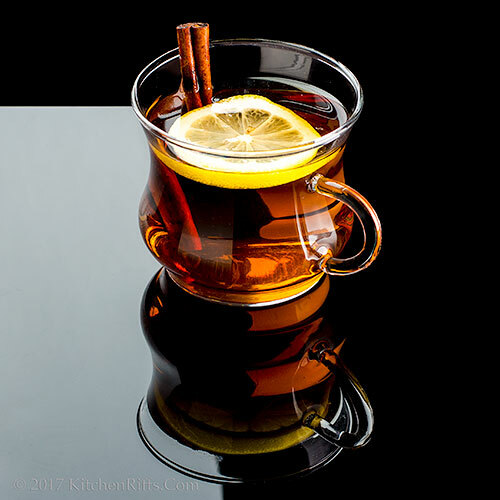 I remember a family holiday function long ago....spiced apple cider helped me through...:) It is nearing the season for these spiced warming drinks. Hi Debra, I think we've all been to those functions where bottomless mugs of this were called for. :D Thanks for the comment. So did we. Enjoyed it a lot. One of my favorite drinks, perfect for a chilly autumn evening. Hi Amalia, this drink goes so well with chilly weather! We have it often at this time of the year. :-) Thanks for the comment. I agree, Autumn will not be the same without this drink -- with or without the rum! Hi Peachy, it's a really nice drink, isn't it? Thanks for the comment. That drink always makes me think of Christmas and ski season in Lake Tahoe. The perfect sip to warm up and to enjoy with friends. Hi Carolyn, this would be a great drink after a hard day of skiing! Thanks for the comment. John, we've got a family recipe for non-alcoholic hot apple cider we like to make when it finally cools off here in Texas too. Your's looks and sounds really comforting and the pictures for this post are beautiful! Hi Marcelle, hot apple cider is SO GOOD, isn't it? Thanks for the comment. Love this! 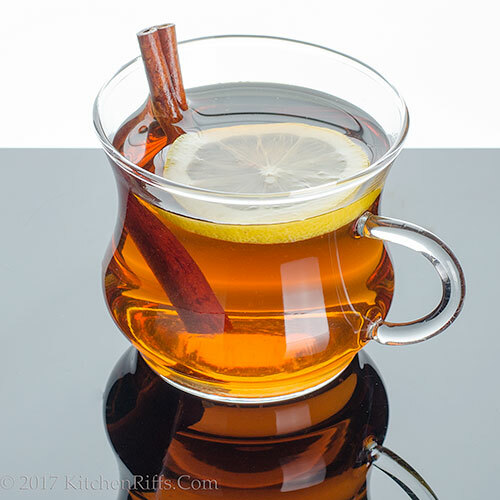 I love mulled cider, or any warmed cider, especially with a bit of rum. So perfect for these damp chilly fall days we've been having lately! Hi Amy, it's been damp and really chilly here lately -- some more of this is in order! :-) Thanks for the comment. Hi Greg, sounds like the perfect prescription. :-) Thanks for the comment. You know how to read my mind ;) we don't have real "cold" weather, but I'm warming up all of my drinks these days to prep for November! And rum is my one drink of choice. Hi Ala, rum has terrific flavor, doesn't it? And works so well with apple cider! Thanks for the comment. Hi Anne, hot cider is really good! And rum is always nice. :-) Thanks for the comment.